It was unprecedented, a team losing its head coach to suspension for conduct detrimental to the pro game, but Saints fans looked forward to that challenge for the team. We bought in that maybe only wily New Orleans could pull this off, with a winning bid for another Super Bowl that just happened to take place here next February. Saints faithful loved the potential awkwardness of those stars aligning while the league hosts its annual convention here, after spanking it with severe penalties in the off-season. Yes, New Orleans can be the most gracious of hosts. But it didn’t take long to see, through a lifeless and winless September, that not only one, but two interim coaching heads was a tour de farce, a much less bad decision than a non-thought out or calculated one, and at its worst, a good old fashioned rip-off. The Saints would have been far soundly and better served by filling the position on a provisional one year basis to a certain kind of background and profile, such as retired Saints head coach Jim Mora, who travels here from the west coast to cover games for WDSU TV, or the retired Marty Schottenheimer, who coached Drew Brees in San Diego. Bill Parcells, Sean Payton’s mentor, had too much ego to qualify. Eric Mangini, a young, sound football guy who once coached Brett Favre (and chided him for all the interceptions), is a guest analyst on ESPN’s First Take, and likely would have preferred the temporary gig to hashing it out with Skip and Stephen A. in the mornings, suitably using it as a platform to audition for a return to the sidelines with another team going forward. Aaron Kromer and Joe Vitt should have stood where they belonged, as valued assistants. Vitt is a stand-up, likable guy, whose post game candor with the press was a breath of fresh air, but his weekly spins about the team not being prepared enough or mentally tough enough to go on the road and win a big game sounded like a broken record, a bad 45 RPM from the Sixties that one would just assume throw in the trash. But give him credit for telling it like it is, and for taking responsibility for it, though the problems loomed larger than him. Bringing in a head coach from the outside did not require changing the playbook, shuffling the staff, or reinventing the Saints’ wheels. There was perception, which now smells like garbage, that the interim position had to be filled from within, or by one of Sean Payton’s “guys”. Which is right where a real GM or owner steps in, to keep things in perspective, and this is precisely where Mickey Loomis and Tom Benson were not to be found. The decision to short change the organization by using fill-ins may have been made by the former but was the responsibility of the latter. There was speculation that Benson did not want to pay somebody else a seven figure salary for a temporary job, but we don’t believe that to be true, particularly since the annual budget was curtailed when Payton got suspended for the year without pay. And Benson is at an age where he can only hope to see the Saints in only so many more Super Bowls. No, there was something else at work with the interim decision; call it a lack of brains, or courage, or both. But we are absolutely sure of one thing, that the billboard of Sean Payton installed over the summer inside the practice facility on Airline Drive with a photo of him over the caption Do Your Job, should immediately be taken to the parking lot, and burned. Handicap, or Excuse? Yet the biggest irony about the interim head coaching dilemma is that this team had enough veteran laden talent from one that won 13 games last year, to coach itself to 9 or 10 wins, without anybody else on the sidelines, except the trainers and a few doctors. Didn’t it look like, as the mistakes and losses added up, that this team basically shrugged its shoulders and all but said, oh, what the heck, Sean’s not here. Whatever. You be the judge. The late 60’s and early 70’s expansion Saints, a circus act if there ever was one, comparatively speaking, did not have a speck of the talent that this team has. But for those of us old enough to remember them, we know who played with more heart. Goats At The Roundtable The 2012 Saints were spectacularly consistent, symphonic really, in every facet of the team taking turns at – screwing up. Early on, had not defensive coordinator Steve Spagnolo overloaded the defense with too may new schemes, and just focused on fundamentals, like tackling and holding onto turnovers when they presented themselves, the defense may not have been as bad as there was one in the NFL since Dwight D. Eisenhower was President. As the defense eventually improved, it’s no coincidence that players were quoted as saying there were doing less thinking and more reacting. Coaches always walk a fine line around too much or not enough schemes and physical preparation, but Spags stumbled across it like a tourist on Bourbon Street. Had he not backed off and let them just play, there would have had to be a mid-season mercy firing, just for the sanity of all concerned. Though he is the quintessential Company Man, Drew Brees does not hesitate to speak his mind about issues that may alienate his employers, whether it was the Collective Bargaining Agreement standstill a year ago, or the Bountygate fiasco this year, a likable part of his persona. But unless our eyesight is really failing us, that was not Commissioner Roger Goodell out there pitching about a dozen interceptions against the 49’ers, Falcons, and Giants – with the season on the line. Do the Saints provide him with medical coverage so he can get his eyes checked, or does he have to wait for Obamacare? And often, when Brees was on target, Marques Colston, Lance Moore, and Jimmy Graham were all coming down with cyclical cases of the drops, like common colds. You can’t point fingers at the running backs when they aren’t given a chance to do anything, as was the case early in the year. But you can certainly take a hard long look at offensive coordinator Pete Carmichael, for developing a case of amnesia that the rules of football, even in this day and age, do not prevent it from being forwardly advanced by handing it off. When the Second Class Citizenship that is the Saints running game finally got involved, only then did they start winning some games. The injury bugs mostly stayed away, except when the promising Charles Brown went down at right tackle in mid-season. Zach Strief stepped in, only to get injured, and then had to come back a bit prematurely when another sub went down (we can’t even remember his name). When he appeared back in the line-up, Strief obviously did not go hungry over Thanksgiving, as he was wrapped with enough mid-riff blubber for him to audition for a new round of State Farm’s Discount Double Check television commercials. They could shoot and theme it in The Big Greasy. Against Atlanta, ordinary veteran defensive end John Abraham ran right by him again and again, padding his sack stats for the year, while Strief was spinning around in quicksand, and Brees was under relentless pressure. Hey Strief, next time you get hurt but are expected back, try salads. In New Jersey, when the Saints got slaughtered against the Giants, the kick-off coverage unit could not tackle the return man holding the football; the only visible defender on the TV screen making a valiant effort was the over-matched Saint kicker, the last line of defense. Not once for a touchdown, which happens, or twice occasionally, for long returns, but three or four times? While this went on, New Orleans negated itself any chance to win. Their guy became an instant star. 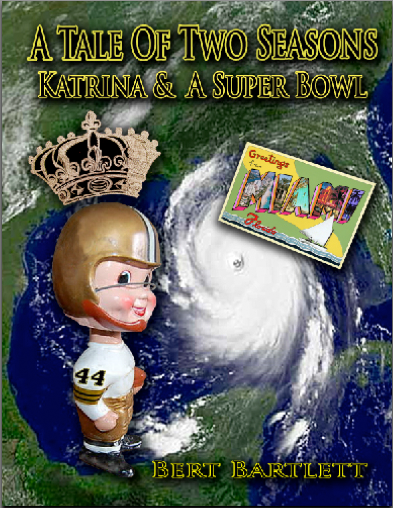 That was the dreariest Sunday evening of the season, putting the final nails in the Saints playoff coffin, as the echoes of the hammer being slammed resonated with those over at the Jersey Shore, on all the houses being repaired following Hurricane Sandy. Leave it to these Saints that they just smothered Tampa Bay with a dominating shutout, their first since 1995, only for it to transpire when the season is competitively over. They will provide some entertainment value in Dallas this weekend in a spoiler role, but nothing else is at stake. More fodder about Cowboys owner Jerry Jones’ friendship with the exiled Sean Payton, and all that infers, a trick bag of possibilities. After that, in the home finale against Carolina, what’s best for this team is for the depth chart to be flipped, like turning the trash bin upside down, so to speak, so that all the young players can be given some experience more meaningful than pre-season. Chase McDaniel has been here several years as a substitute, but does anyone really know what he can do over 60 minutes in case there comes a time when he is needed to go out there because Brees can’t play? The mop-ups don’t count. Your guess is as good as mine. As for any veteran starter on the team whose feelings might get hurt in being “benched” for the final game? Tough sh…. You had 13 chances and went 5-8 until being eliminated from the post season. Heck, we should have done this a few weeks ago. Next? On and off the field, from start to finish this year, the roundtable got crowded, and the theatre got bad. Bountygate (and all the recurring he said, she saids, which are still going on). Suspensions. Brees’ new contract (which was foolishly signed on a Friday the 13th). The Vilma lawsuit. Player suspensions vacated. And now the last act: Sean Payton’s contract voided in a technicality before the scandal broke, and now there is some doubt that he may return (though we think he will, the only hold-up being his agent trying to get a better deal to make up for some dual lost income). Saints fans are to be forgiven if they have simply tired of the sight of all the beady eyes, pointed ears, and whiskers in Black & Gold sitting around the table, making the noises that they did. It was a war of attrition to stay positive about this team – and kind of like the Civil War, we lost. The curtains can’t close on this show soon enough. The Post Katrina, feel good Saints are visible only in the rear view mirror. This is not to say we have lost our affinity for the home team. The organization could help with reparations if they would spice up the home finale with humor. When fans enter the stadium wooden clothespins should be given out, just in case the Saints stink up the joint. Free fries anytime the Saints tackle an opponent returning a kick-off. Ticket draws for second half free lap dances by the Saintsations, in part to encourage fans to stay. A plethora of Second Line jazz trios, tooting funeral dirges. And an I Can Do It Better participant campaign, where dressed up, chosen fans can stay on the sidelines and maybe get snuck into the game for a few plays in the fourth quarter. The Pope at free safety! Whistle Monsta’ at linebacker! Darth Saint at nose tackle! And throughout, a ticket stub should be good for a complimentary Bloody Mary, because oddly enough, the Dome has some of the best Bloodies in the city. Are we in for another round of prolonged contract negotiations with Peyton, like we endured with Drew Brees last year? If Sean Peyton wants to leave, let him. Have a talk, call his bluff, sign him now or move on. Next Post What Art Thou Soul Of The Saints?